I haven't read any from this line either. I gotta say, Lucy's idea of roughing it and mine are one-in-the-same. I still covet your book group:) Food and books, how can you NOT want to join? I adore romantic comedy…those nasty snowball treats, not so much. I'm with Susan…I want to be in your book club! "My only disappointment? 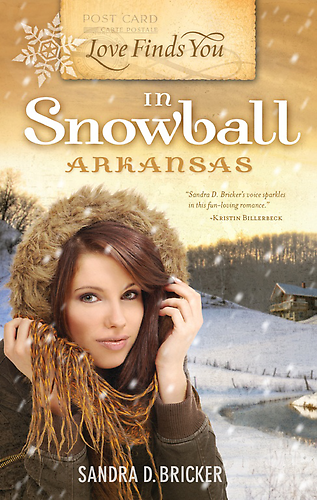 She had ripe opportunity to say the phrase, 'Not a snowball's chance in…Arkansas.' and she didn't!" You don't like marshmallows? Oh sweet Jesus, forgive her!!! (Although I'm not a fan of those snowball things either.) Haven't read too many Love Finds You books, but if I'm being honest, the ones I have read aren't my fav. This was the first book I read of hers and it kept me chuckling!! 🙂 I thought it was very cute. And yes, I like romantic comedy, although I haven't read a whole lot of it. But I like to laugh, so I'm not sure why I haven't! And yes, I've enjoyed Sandra's books before too! I need to add this! I LOVE marshmallow–but no, no processed desserts. Bleh. I love romantic comedy too! Yeah, I don't like those Snowballs in a package…yuk. I have not read Sandra's work. I might just have to pick this one up. I totally knew that was your quote at the end before you even told me. I like Sandra's work but I MUST mix it up with drama in between, otherwise, I enjoy a quick-read rom-com and Sandra never fails to deliver. The processed snowballs – no. But homemade, now that's something we do at Christmas. Just a few, but fun for everyone. Love reading the comments from your group. Yes on romantic comedy but blech on snowballs. I love reading romantic comedies and I've read Sandie's novels. She has a laugh-out-loud sense of humor woven through all her books — and her characters aren't your run of the mill, I've seen 'em before kind of hero and heroine. I'm putting this book on my list.